My intent is to get more IT pros aware of Windows Azure Infrastructure Services, and I thank you all for tweeting and helping more better learn Windows Azure. To demonstrate the user experience, I am also including a set of screen captures of two runs of QSK within the same PowerShell session in this post. # The content of this post is provided AS IS; with no warranties, and confers no rights. # This script is available for download at http://aka.ms/QSK. # It deploys a set of Windows Azure VMs and each with a data disk. # with a load-balancer on port 80, and placed into a service. # script is extracted into the folder, _QSK. # Virtual network is not employed in this script. # (3) the Windows Azure subscription name. # in a load-balancer on port 80. # The script has neither error handling, nor optimization of any kind. # Windows Azure IaaS deployment methodology and Windows Azure PowerShell. # and sharing your enhancements made on this script. # log in Windows Azure for verifying the results of executing the script. # management portal is optional. # get-AzureLocation to test the connectivity with Windows Azure. # session must be in place, else the script obviously will not work. # 3. Open this script and validate the required parameters. # statements followed by pressing F8 in ISE. # changes of the [optional customization] section, as preferred. # by following the instructions in the clean-up routine. # content of Windows Azure IaaS and Windows Azure PowerShell. Here’s the history of a PowerShell session where I deployed two services by executing the script twice. To remove all deployed resources, the 4-step clean up routine was run on step at a time. A quick review of these capabilities in Windows Server 2012 is included in http://aka.ms/7ways. The above measures were observed upon the initial login after a clean installation of respective server installation options. So the difference between the two is about 4 GB. 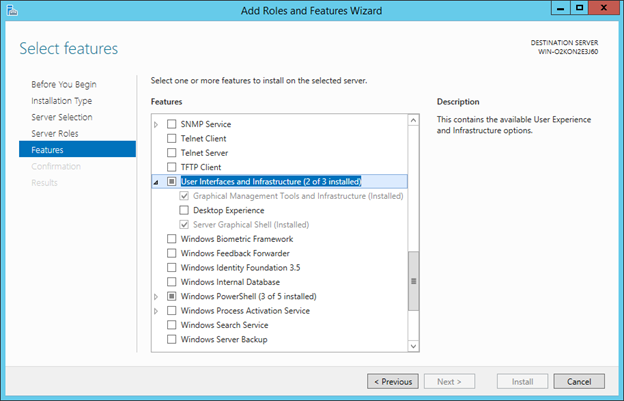 There are three install states of a role or feature in Windows Server 2012 R2, namely Available, Installed, and Removed. When the payload of a role or feature is removed from current installation, the Install State in the output of Get-WindowsFeature is “Removed.” In earlier build of Windows Server 2012, you may have seen the state as “Disabled with payload removed” instead. To verify a specific install state of roles and features, simply filter out the output of Get-WindowsFeature accordingly. The following statement displays those roles and features have been installed, for example. The following are the install states of roles and features for the two installation options. Based on the above two outputs Server with a GUI have three components which Server Core does not install. Graphical Management Tools and Infrastructure, Server Graphical Shell, and Windows PowerShell ISE. The two graphical components are relevant to server installation options as presented in Part 4. 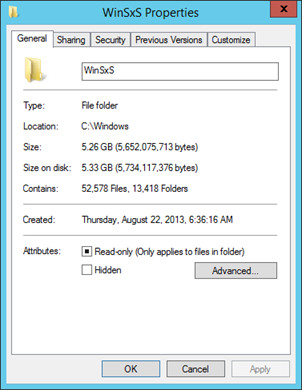 This is the folder where the payload of a Windows server 2012 role or feature is stored. When a feature’s payload is removed from an installation, it is deleted form the side-by-side store at %SystemDrive%:\Windows\WinSxS. In such case, the output of Get-WindowsFeature will list the feature as “Removed” state. Similarly, when a feature with a “Removed” state is added from an installation source, the payload is placed into the WinSxs folder. Consequently, the size of this folder varies as features workloads are removed or added. The default size of the site-by-site store, i.e. c:\windows\winsxs, of a Server Core installation is around 3 GB with the following query directly executed in a Server Core command prompt, as shown below. where ls and measure are aliases of Get-ChildItem and Measure-Object, respectively, in PowerShell. Here the folder size of is taken by running Get-ChildItem on recursively, i.e. while crawling through the directory structure, it sums up the size of each ChildItem in each folder. While a Server with a GUI installation, the side-by-side store has a size of 5.3 GB as shown below, Here since the GUI is in place we can easily get a folder size reading from the folder properties using File Explorer. 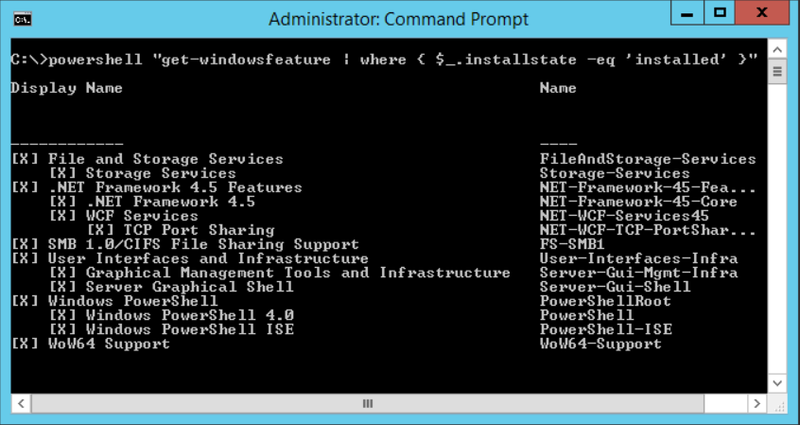 And we can run the same PowerShell statement in a command prompt as well as the following. With Features on Demand, we can now develop minimal server footprint by removing the payloads of all unwanted roles and features from a target configuration. Here is a sample process to develop a server image with minimal footprint for VM deployment. Here, for example, the target server configuration is a clean install of Windows Server 2012 R2 Server Core VM as a baseline with the following roles and features removed. In this example, freshly install of Windows Server 2012 R2 Server Core, followed by running Get-WindowsFeature to verify the roles and features put in place as shown below. On a server instance with the target baseline configuration, run Uninstall-WindowsFeature with –Remove to remove the payloads of unwanted roles and features. The process is to run Uninstall-WindowsFeature with the parameter, –Whatif, first as shown below and examine the output with the expected results. Once all are confirmed, run the same statement without –Whatif to actually remove the payloads of unwanted roles and features. Notice in this example, to facilitate the operations in a Server Core VM, I placed the above PowerShell statement in two script files (one with and the other without –Whatif) in a VHD and dynamically attached the VHD to the VM using iSCSI controller in the VM settings of Hyper-V Manager. Then, in the VM used diskpart to take the VHD online, erased the readonly setting of the disk with diskpart’s attributes command as needed, then started a PowerShell session to run the uninstall-windowsfeature.with-whatif.ps1 and then uninstall-windowsfeature.without-whatif.ps1. As shown below, E: drive was where the VHD with the script files mounted. And the output of Get-WindowsFeature also set the install state of the unwanted roles and features as “Removed” as shown below. In this example, the side-by-side store of a clean install Server Core had 41,967 files with a total size of 3,136,861,233 bytes. And after removing selected payloads of unwanted roles and features, the side-by-side store then had 41,284 files and a total size of 3,082,661,112. The significance of employing Features on Demand is not only the opportunity to develop a minimal footprint based on a target configuration and reduce the size, but the elimination of unwanted code is a strategic step for better securing servers, developing applications, and managing an IT environment. Run c:\windows\system32\sysprep\sysprep.exe in an admin command prompt and select Generalize and Shutdown to produce a deployment image with minimal server footprint of the target configuration specified on Step 1. There are times for business needs, productivity, or a personal preference an administrator may want to restore selected roles or features on a deployed server instance. In this case, if the roles or features have been removed from the instance, i.e. 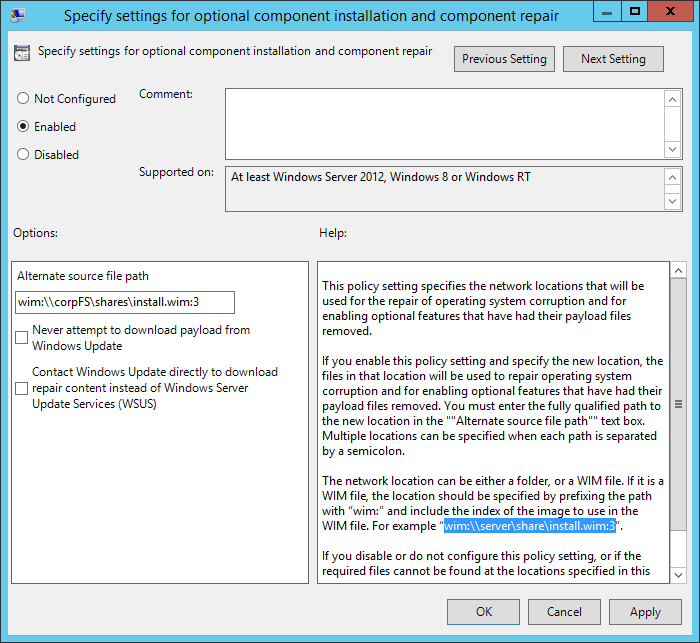 with an install state, Removed, the Install-WindowsFeature statement must then include the –Source parameter with one or more installation sources. An installation source can be restored only to a server instance with the same version of source code. By default, Features on Demand uses Windows Update if not able to resolve any installation source. In a managed environment, we can set up file shared folders, as installation sources, to store the files required for installing the payloads of roles and features on server instances running Windows Server 2012 or later.They are in essence remote side-by-side stores. 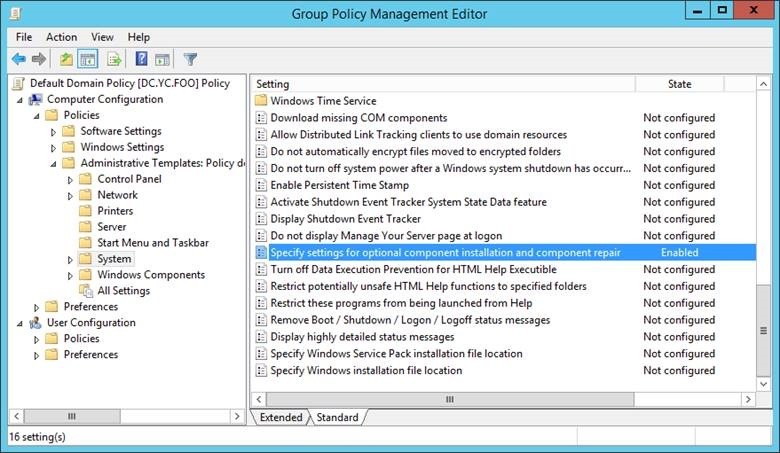 In this way, these shared folders can be employed as installation sources, as needed, and as well specified in Group Policy as the designated installation sources to better manage the installation process. To create a remote side-by-side store, simply copy the Sources\SxS folder from a target version of Windows Server installation media to a folder followed by sharing it out with proper access rights for target users. For multiple installation sources, use a semicolon to separate each. A location here must be either folder or a WIM file with fully qualified path. Notice that the latter must be with the prefix, win: and include the index of a target image in the WIM file in the format of win:<fully qualified path to WIM file>:index as illustrated below. In an event, this setting is needed, however not configured or it is disabled or not resolvable, the process will try to download source files from Windows Update. A final note on Feature on Demand, when installing or removing a role or feature, Windows will observe dependencies on the administrator’s behalf. It is a best practice to first test the cmdlets, Uninstall-WindowsFeature and Install-WindowsFeature, by including the parameter, –Whatif, and verify the changes with expected results as demonstrated earlier in step 3. In Part 1, I talked about at server installation time, there are two installation options: Server Core and Server with a GUI, available. And the third installation option, Minimal Server Interface, is configurable after an installation is completed. Minimal Server Interface is basically a Server Core installation with Server Manager and MMC. And as needed, an administrator can switch among the three installation options with Features on Demand as detailed in Part 1. The operations to switch installation options are on mainly two components: Graphic Management Tools and Infrastructure and Server Graphical Shell. The following shows where the two components are listed in Server Manager “Add roles and features” wizard and an output of PowerShell Get-WindowsFeature cmdlet, respectively. Notice in Server Manager wizard, what we see are display names. When Server Manager is available, i.e. either in a Server with a GUI or Minimal Server Interface, we can simply use checkboxes of the two components to change installation options. The output of Get-WindowsFeature as shown above on the other hand returns a table of Display Name, (Class or Object) Name, and Install State listing out all the roles and features with their states. And the highlighted items are the corresponding part to what is shown in Server Manager wizard. The following depicts the two components involving server installation options. The two components are with (class or object) names: Server-Gui-Mgmt-Infra and Server-Gui-Shell. In production, Server Core may be employed as a deployment standard. Which does not provide the server graphical UI like Server Manager or MMC at all. There are times it is more productive or as a preference to operate with the server graphical UI. In such case, an administrator can enable or disable the server graphical UI, namely switch the installation options by enabling or disabling the above mentioned components. Server-Gui-Shell requires Server-Gui-Mgmt-Infra. Under the hood, these two components are installed together. However Server-Gui-Mgmt-Infra can be enabled without enabling Server-Gui-Shell, not vice versa. Enabling only Server-Gui-Mgmt-Infra does not enable Server-Gui-Shell, which resolves in Minimal Server Interface, i.e. Server Core with MMC, Server Manager, but not full graphical shell. Enabling Server-Gui-Shell automatically enables Server-Gui-Mgmt-Infra, the two together resolve in Server with a GUI, i.e. full graphical UI. Disabling only Server-Gui-Mgmt-Infra also implicitly and automatically disables Server-Gui-Shell, which resolves in Server Core user experience. 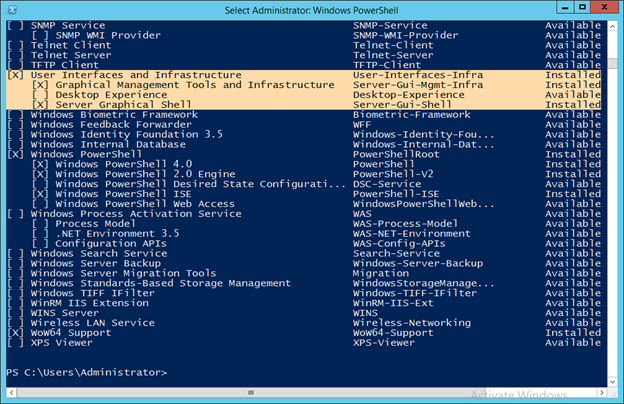 Using Server Manager PowerShell cmdlets as detailed in Part 3 below is the most straightforward way to switch a server installation option. Here are four sample statements to all possible scenarios. Notice that the above statements can include the parameter, –Source, to specify installation sources if the workload of an operated feature has been previously removed as shown below. By default, if an installation source is needed and not found or not specified, it will try to download the source from Windows Updates. Or use the parameter, –Remove, as in the following sample to in addition to disabling the feature remove the associated workload from the side-by-side store as well. Use get-command to list out and there are three cmdlets in ServerManager module as shown below..
Notice that Install-WindowsFeature and Uninstall-WindowsFeature replace Add-WindowsFeature and Remove-WindowsFeature, respectively. The latter two cmdlets were used to install features in Windows Server 2008 R2 and are now as aliases. The first thing to do is to always use Get-WindowsFeature to find out what roles and features are available and the current state of the machine. 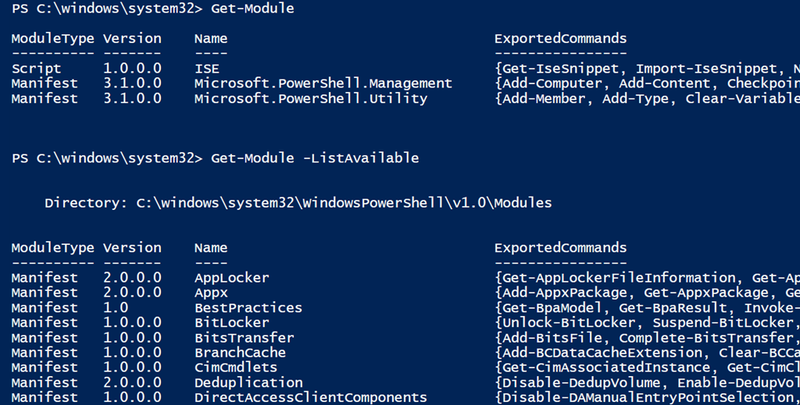 The output also reveals the precise Feature Names to use with Server Manager PowerShell cmdlets as shown below. Display Name shows what we see in Server Manager graphical UI when adding or removing roles and features. The actual class or object names are listed under Name. The object name is what to use with Server Manager cmdlets. A checkmark preceding a display name means that the role or feature is currently installed as indicated by what is shown in the Install State column as well. To disable a Windows feature, use the Uninstall-WindowsFeature cmdlet. This makes a feature unavailable, however the associated payloads are still in place. Basically the feature is disabled, nevertheless the associated code is still there. This also means the feature can be easily restored by Install-WindowsFeature without reinstalling the source code. The following are PowerShell examples to disable and later re-enable the feature with the display name, Server Graphical Shell, and Server-Gui-Shell (which is a feature component under User Interfaces and Infrastructure) as the corresponding parameter name on the local machine. In Part 4 of this series, it will become evident that this particular component is relevant to a server installation option. Again the above operations basically make Server Graphical Shell unavailable without actually removing the associated code from the local machine, or enable Server Graphical Shell based on already installed code on the local machine. Since there is no code being removed or added, the footprint of the installation is not changed. To remove the payloads of a Windows feature, use the Uninstall-WindowsFeature cmdlet with the parameter, Remove, similar to the statement below. 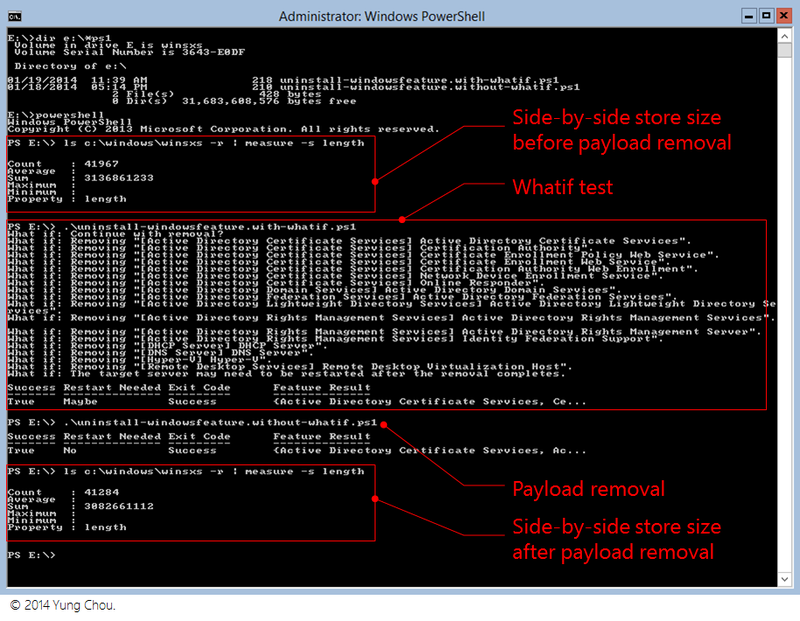 Here, payloads of the component, Server-Gui-Shell, is removed from the local installation. Running Uninstall-WindowsFeature with the parameter, Remove, brings the feature to a state, “Disabled with payload removed.” You will see this shown in the “Install State” column of those roles and features with payloads removed from the output of Get-WindowsFeature. To reinstall features with the state, “Disabled with payload removed”, an administrator runs Install-WindowsFeature cmdlet with the parameter, Source, for specifying the location of an installation source. And the source must be from the exact same version of Windows for the reinstallation to work. Without the parameter, Source, PowerShell will use Windows Update by default to look for an installation source. The following statement restores server graphical shell from a side-by-side folder is in D drive, for example. The cmdlet restores specified roles, role services, and features on a computer that is running Windows Server 2012 and later, or on an offline virtual hard disk (VHD) on which Windows Server 2012 and later is installed. With the parameter, Source, referencing either a network path or the path to a Windows image file (WIM), Install-WindowsFeature can reinstall the associated payloads to the local side-by-side store.